Officially known as Republic of the Sudan or Jumhūriyyat al-Sūdān, SUDAN (السودان) is situated in Northeast Africa. Sudan is Africa's third largest country after Algeria and the Democratic Republic of the Congo. Once the largest country in Africa, Sudan shrank in size when South Sudan achieved independence on July 9th, 2011. Since 2011, Sudan no longer shares a border with the DR Congo, Kenya, and Uganda. In its current size, Sudan borders seven countries: Central African Republic to the southwest, Chad to the west, Egypt to the north, Eritrea to the east, Ethiopia to the southeast, Libya to the northwest, and South Sudan to the south. Subdivided into 100 qirsh (piastres), the currency is the Sudanese Pound — its ISO 4217 currency code is SDG. Since January 1st, 1956, Sudanese citizens annually celebrate Independence Day on New Year's Day to remember Sudan's independence from Egypt and the United Kingdom. ● ● ● ● ● People and Places ● ● ● ● ● Sudan is home to approximately 40.5 million (40,500,000) citizens, according to GeoFact of the Day's 2018 population estimate. With over 5 million people in the metropolitan area and 720,000 people within the city limits (2018 population estimate), the national capital of Sudan is Khartoum. Across the Nile river and northwest of Khartoum is Omdurman (Umm Durman), the most-populated city in Sudan with approximately 2,440,000 people (2018 estimate). In the Nile river and between both cities is an island named Tuti or Tutti. Other cities and communities in Sudan include Al-Fashir (El Fasher, population 300,000), Al-Ubayyid (El Obeid, 450,000), Dongola (Dunqulah), Geneina (Al Junaynah), Kassala located near Eritrea (450,000), Nyala (600,000), and Port Sudan (500,000). According to Ethnologue (↗), 75 main languages are used for communication in Sudan. English, Standard Arabic, and Sudanese-spoken Arabic are principal languages. Other languages many people use to communicate include Ama, Bedawiyet (Beja), Berta, Fur, Gaam, Kanuri, Koalib, Masalit, Nobiin, and Zaghawa (Zeggaoua). Berti and Birked are two extinct languages that are not used for speaking or writing anymore. Regarding the three nearly extinct languages in Sudan, about 200 people communicate in Kelo, 100 in Molo, and 1,500 in Talodi. About 70% of Sudan citizens are Muslims, followed by Christians (17%), believers in folk religions/traditions (11%), and Bahá'í believers (less than 1%). ● ● ● ● ● Land Features ● ● ● ● ● The land of Sudan is dominated by the Sahara Desert in the north and center; mountains along the southern and western borders and near the Red Sea east of Sudan; plateaus and hilly areas all around; semi-arid grasslands in the southern half; and marshes along the White Nile river. The smaller-than-the-Sahara Libyan Desert occupies the northwestern portion of Sudan. In the Darfur region of western Sudan near Chad, the Jebel Marra volcanic field and Sahara Desert and the El Heitan and Teiga plateaus are prominent land features. According to Smithsonian's Global Volcanism Program (↗), the last eruption at Jebel Marra was 2,000 BC/BCE. Types of rock found here include basalt, latite (trachyandesite), phonolite, trachybasalt, and trachyte. Sudan's highest point is at a crater (caldera) in Jebel Marra. The Deriba Caldera sits 3,042 meters and 9,980 feet in elevation above sea level. The Nuba mountain range stretches across southern Sudan near South Sudan. Extending from the capital Khartoum in east-central Sudan northward to Lake Nasser (Lake Nubia) and the northern border of Sudan, the 1,400-kilometer Nile River meanders through northern Sudan. Near Khartoum in east-central Sudan, the Nile splits into the White Nile and Blue Nile tributaries. If you are sailing on the Nile from the capital city, the White Nile leads you to South Sudan and the Blue Nile leads you southeast toward Ethiopia. ● ● ● ● ● Sudan's Border Disputes ● ● ● ● ● Sudan currently (as of April 2018) has two ongoing border disputes — one each on the south and north borders. South Sudan wants to have a polygonal piece of land called Abyei, shown as a small dotted square on the GeoFact of the Day map. This area is significant because of oil reserves. In northeastern Sudan, the Hala'ib Triangle is claimed by Sudan but controlled by Egypt. The Ilemi Triangle of Kenya used to be claimed by Sudan, but now that issue lies in the hands of South Sudan. This post was comprehensively updated with more information on April 18, 2018. 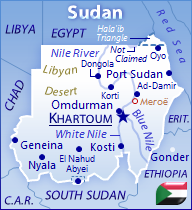 The map of Sudan was added to this post on February 15, 2013.